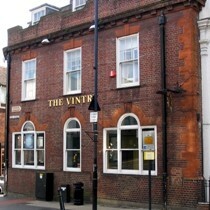 The Vintry in St Albans is a large pub built in the 18th Century that was a Barclays Bank for a while. No real ale and the wine and lager choice was very limited, the Grolsch on tap was "off". Service was quite good and plenty of seating available (10pm on a Thursday). As it is a large pub with high ceilings it was lacking in atmosphere and had no character. Two plasma screens were showing Sky Sports News. Background music was good but a little loud. One of our group reported that the ladies toilets were unpleasant. At the weekends the Vintry gets very busy with youngsters who fancy a drink and a dance, however it's a fairly unfriendly, unpleasant atmosphere. Best part about this place is the nice garden at the back. Wi-Fi access is provided by The Cloud. Re-opened following a major refurbishment. Totally transformed with new smart but traditional interior including sofas and arm chairs; slightly oriental style. Low level lighting with table lamps and candles. Wood floor with rugs. Background music that increases in volume around 10pm at weekends. Now offers a wide range of bottled and draught beers with three real ales. Up to forty different wines starting at £10 a bottle. Home-cooked food served until 10pm. At the time of the re-review only one real ale was available; Hampshire Bewitched. This was disappointing as three ales (Gales HSB, Spitfire, IPA) were available when the Vintry re-opened in August. Hopefully this reduction to one ale is temporary. A good selection of premium lagers is available, including Black Budvar, and these are often served in their own unique glass. Nice comfortable venue with plenty of seating areas. No plasma screens or other tvs. It was fairly quiet at the time of the visit (9pm on a Wed) but in a way this adds to the comfortable relaxed atmosphere. Slowly turning back to the old Vintry (not good!). Real ale selection is now very limited and disappointing quality. Service is poor and the atmosphere of the place isn't as nice as it was straight after the 2007 refurbishment. Scores have been revised downwards. Re-opens as a Cote Brasserie.